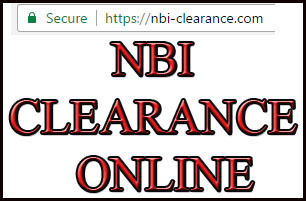 Home NBI NBI Clearance 2019 Updates: How to apply NBI Clearance Online for New Applicant. NBI clearance updates and how to apply for a new applicants. Last Edited: January 2019 | In the first quarter of the month last year 2016, NBI clearance site were updated. As we visited the site again, the webpage updated with new design and color. While the process of NBI application is still the same. Here! the site added additional features for payment, security and announcement. GUIDE ON RENEWING NBI CLEARANCE! ANNOUNCEMENT: For 12 March 2018. The PUBLIC is hereby advised that effective 12 March 2018, the NBI will be charging a fee of ONE HUNDRED THIRTY PESOS (Php130.00) per clearance certificate from the original ONE HUNDRED FIFTEEN PESOS (Php115.00) to comply with Documentary Stamp Tax (DST) rate adjustment. This is pursuant to Republic Act No. 10963, otherwise known as the "Tax Reform for Acceleration and Inclusion (TRAIN) Law" and Revenue Regulations No. 4-2018 issued by the Bureau of Internal Revenue (BIR). 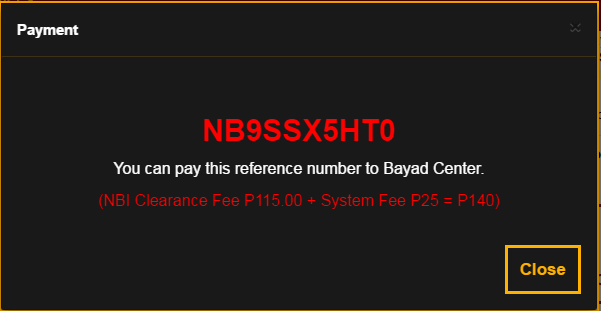 Aside from the recent form of payment (Bank over the bank, Online Bank, Mobile Payment, Bayad Center) the site added the new MULTI-PAY option for payment, wherein you can use the Multipay wallet. To register, please go to www.multipay.ph. Also added recently, ECPay and 7Eleven. ANNOUNCEMENTS: Effective December 27, 2016. The NBI Clearance Processing will strictly implement the "NO APPOINTMENT NO ENTRY POLICY" for NBI clearance applicants. No appointment will be available on the same day of application. All NBI Clearance applicants are advised to register online and have their appointment date set in advance. Please be guided accordingly. Please be advised that NBI helpdesk is only available from 6:00AM to 6:00PM only. by using the QR Code by positioning your this QR code from your NBI Clearance Form in front of your camera lense and wait for a while until it reads and verified. * if not already paid or still have pending transaction the system will says it is till in process and please try again later. *If you are not eligible, the system will automatically says you are not eligible to avail NBI Delivery Service. You may need to change your numeric PIN Code here. 3. NBI Clearance Renewal Delivery! 5. If you need to print your Application Form after you paid the NBI Fee. Sign-In > Transaction > Action: DETAILS > Print Application Form Button. Printing of Application Form is NOT necessary! You can list down your REFERENCE NUMBER in a sheet of paper or image-capture this page using your mobile phone. Please be reminded that you have also the option to "Cancel" your transaction! Application guide for applying NEW NBI CLEARANCE. (1) Kung may account na online at sa Application > application type = RENEW, deretso mo na i-apply for renewal and Delivery option ay available na. - Retrieving information via old NBI #. - Provide NEW email address and pwd. 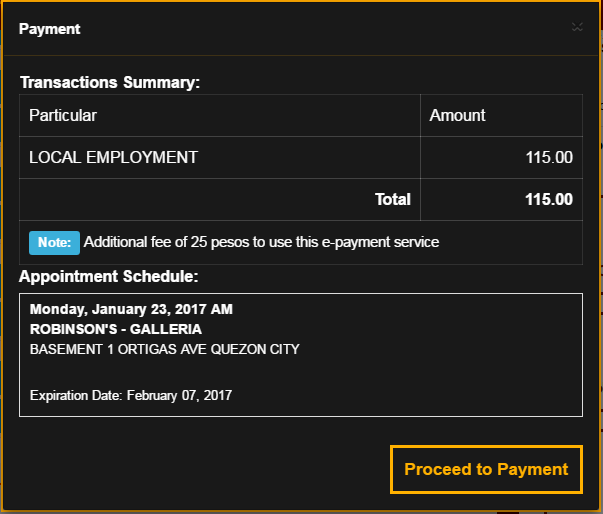 Note: Can Use imaginary email > Click "Sign UP" then pag-okay na > Sign-in using newly used credential then make you appointment date na. Do you have an OLD NBI CLEARANCE? Select "NO". Provide the information in the blank. Note: First and Last Name, Birthdate and Email Address is fixed data, it means after this Sign-Up these above inputs will be unable to edit, so please make sure that the information is correctly typed. And please save the your email and password for future use. 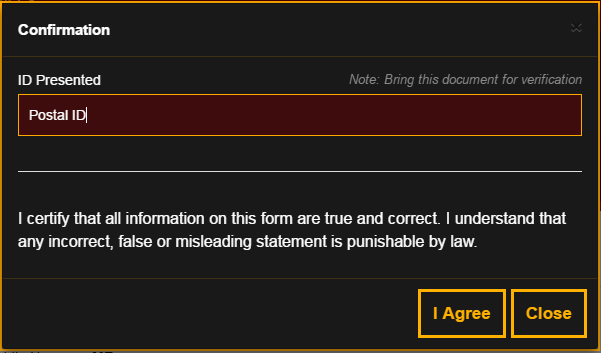 Once you click "I accept Terms of Service" and "SIGN UP",a message box will appear as shown below. 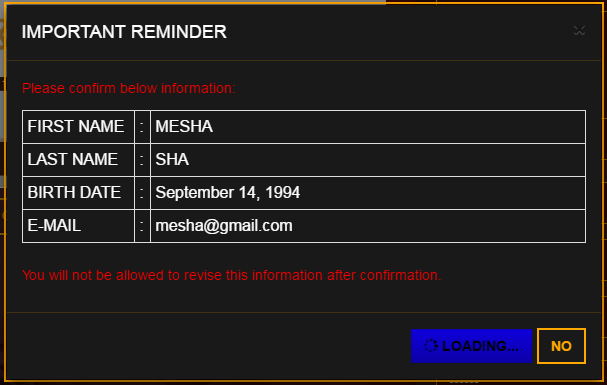 You just need to confirm the information before you proceed. Sign-In your newly created account. No need to verify/ No verification is needed. It will direct to your PROFILE. PROFILE > APPLICATION: Clicked EDIT INFORMATION below the APPLY FOR CLEARANCE button. Edit and Add the needed information. Read again your personal details then Click SAVE INFORMATION. Now click APPLY FOR CLEARANCE on the upper right side. See image below. NOW SET your 6 digit PINCODE and remember to save this PINCODE for future use. Type your valid ID available that you will present upon claiming your NBI Clearance. Then click I AGREE. Then IMPORTANT REMINDER will appear. Read and just close it. Complete your application (SELECT NBI BRANCH, PREFERRED DATE, PURPOSE AND PURPOSE DETAIL, AND THEN PARTICULAR AND AMOUNT IS AUTO-GENERATED, PAYMENT OPTION). See sample image below. In this example it used BAYAD CENTER. It's DONE.Pay the Fee and come to your appointment date. To see this on your profile Click TRANSACTION on your menu. If you wish to cancel here you are free to cancel your payment. See sample image below. 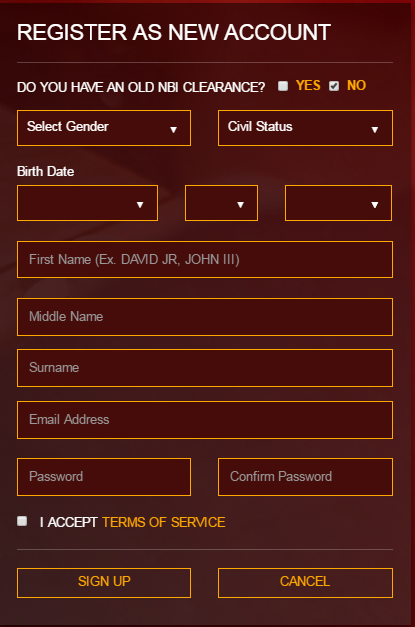 Don't forget to LOG-OUT of your NBI CLEARANCE ACCOUNT and save the necessary information needed. 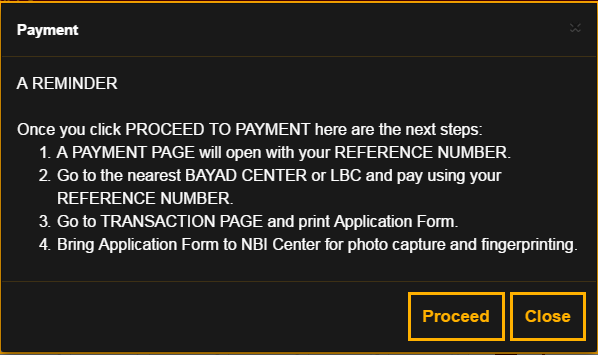 Once you have paid the your NBI Fee, you may now check again the status of your pending payment on the TRANSACTION MENU. You'll see the word PAID. see image below. 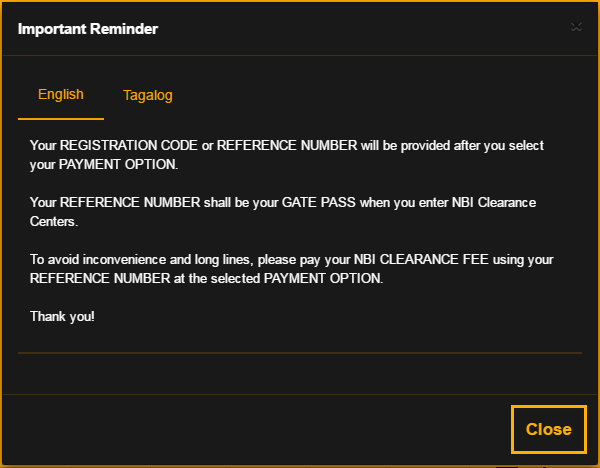 - GUIDE ON RENEWING NBI CLEARANCE! - NBI Clearance valid ID. How To Apply ATM or Passbook Savings Account? theres no option for pickup or delivery. what should i do?